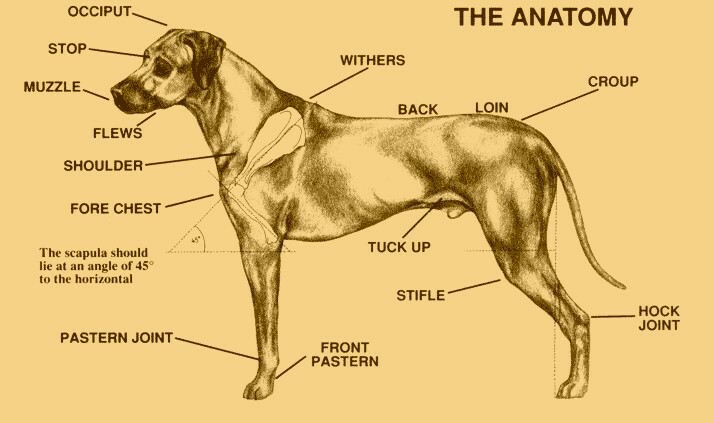 Description of the Rhodesian Ridgeback. The peculiarity of this breed is the ridge on the back, which is formed by the hair growing in the opposite direction to the rest of the coat. This ridge, which must be regarded as the escutcheon of the breed, is broad behind the shoulders and tapers off towards the root of the tail. It should be clearly defined and start immediately behind the shoulders and continue up to or over the loin. In shape it resembles a fiddle with the string towards the tail. A dog without a clearly defined ridge is not recognised as belonging to this breed. In general appearance the Ridgeback should represent a strong, muscular and active dog, symmetrical in outline and capable of great endurance with a fair amount of speed. The head should be of fair length, the skull flat and rather broad between the ears and should be free from wrinkle. The stop should be defined and not in one straight line from the nose to the occiput as required in a Bull Terrier. The muzzle should be long, deep and powerful, jaws level and strong with well developed teeth, especially the canines or holders. The lips clean, close fitting the jaws. The eyes should be moderately well apart and should be round, bright and sparkling, with intelligent expression, their colour harmonising with the colour of the dog. The ears should be set on rather high, of medium size, rather wide at the base and gradually tapering to a rounded point. They should be carried close to the head. The nose should be black but a lighter colour is admissible if it is in keeping with the colour of the dog. A spotted nose is incorrect, but is not a disqualification. The neck and shoulders. The neck should be fairly long, strong and entirely free from throatiness. The shoulders should be sloping, clean and muscular, denoting speed. The body, back, chest and loins. The chest should not be too wide, but very deep and capacious, ribs moderately well sprung, never rounded like barrel hoops ( which would indicate want of speed); the back powerful; and loins strong, muscular and slightly arched. Legs and feet. The fore legs should be perfectly straight, strong and heavy in bone, elbows close to the body. Fore feet round, compact, with well arched toes, round tough elastic pads, protected by hair between the toes and pads. In the hind legs the muscles should be clean, though well defined and the hocks well let down. The tail should not be too strong; strong at the insertion but gradually tapering towards the end, free from coarseness. It should not be inserted too low down, but carried with a slight curve upwards and never curled.A short tail is a blemish, but not a disqualification. The coat should be short, hard, dense and fine, sleek and glossy in appearnace, but neither woolly nor silky. Colours: Brindles, fawns, sables, whole colours or mixed with white. Size: Up to 70 sm. Weight: Up to 36 kg. Adopted by the South African Kennel Union (now the Kennel Union of Southern Africa) in 1924.